What better way to spend New Year’s Eve than in your own neighborhood celebrating with family and friends! The Country Club of Landfall is hosting two parties Sunday night for the big event. One event is the Family New Year’s Eve Party, which will be held from 3:00pm until 6:00pm. 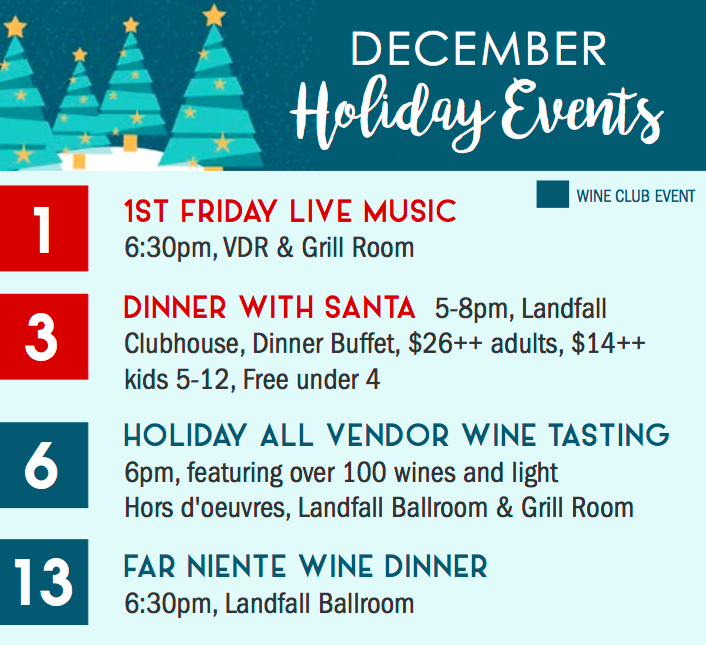 This children friendly event will be held in the Nicklaus Clubhouse Ballroom and will include a buffet meal, DJ, champagne and sparkling cider toast. Later that night the party for the adults will be held at the VDR and Grill Room. From 6:00 until 10:00 there will be a pix fixe dinner. The delish menu incorporates a variety of exquisite dishes including beef tartare, lobster bisque, filet mignon and shrimp, roasted Colorado rack of lamb, and a black and white chocolate mousse entremet. 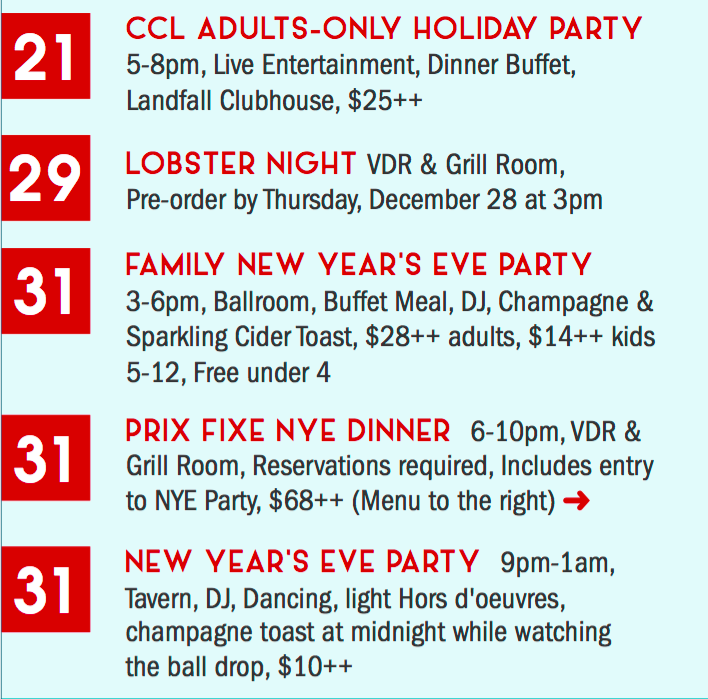 Following the New Year’s Eve Dinner will be a party to ring in the New Year, from 9:00pm to 1:00am. Taking place in the Tavern the party will have a DJ playing great music all night and plenty of dancing. Additionally there will be light Hors d’oeurvres, and a champagne toast at midnight while watching the ball drop! The new Sports Center at the Country Club of Landfall is having its grand opening today! After extensive renovations the state of the art gym is now ready. The new Sports Center features new décor, expanded space, new equipment, and new programs. Some of the programs include ZenCycle, Rise and Shine Yoga, Dynamic Barre, Power Pump, and Bootcamp. Staff will be readily available to show members around the gym, explain how the new equipment works, and introduce the new classes. The Sports Center is open Monday-Thursday 5:00am until 10:00pm, Friday 5:00am until 9:00pm, and Saturday-Sunday from 6:00am until 9:00pm. Come see all the exciting updates! Perched on a high bluff in the gated waterfront neighborhood of Landfall, this home overlooks the Intracoastal Waterway, Wrightsville Beach, and the beautiful Temple Garden. 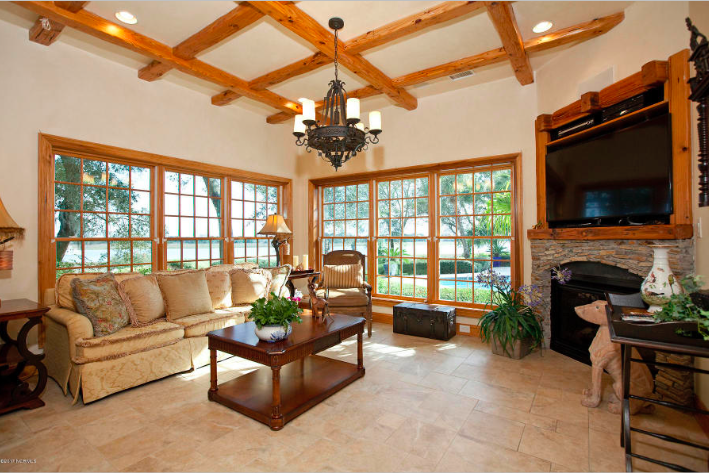 Over 6,000 square feet of very comfortable living, this bright and sunny home has both first and second floor master bedrooms, additional three bedrooms with baths, a gourmet kitchen, an office, sunroom, living room, parlor, den, breakfast room, entertainment room, three fireplaces, and enormous closets. 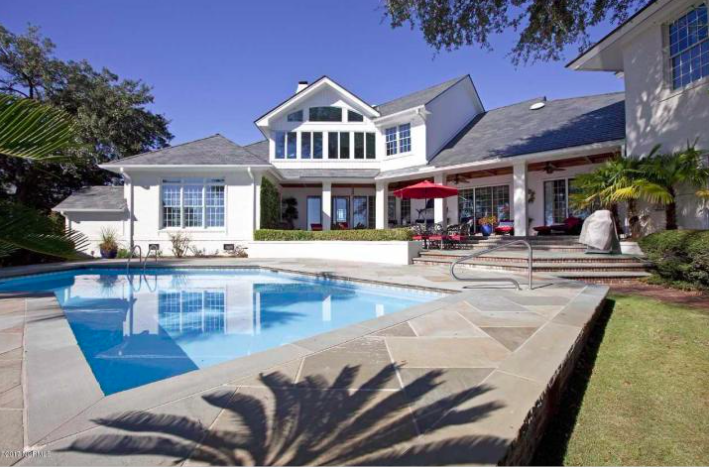 The outdoor living space is breathtaking with a covered back porch overlooking a beautiful pool, gardens, and the waterway. While in the heart of Landfall, this property is close to the beach, shopping and dining. The perfect holiday event is back! Enchanted Airlie is now taking place at the breathtaking Airlie Gardens. 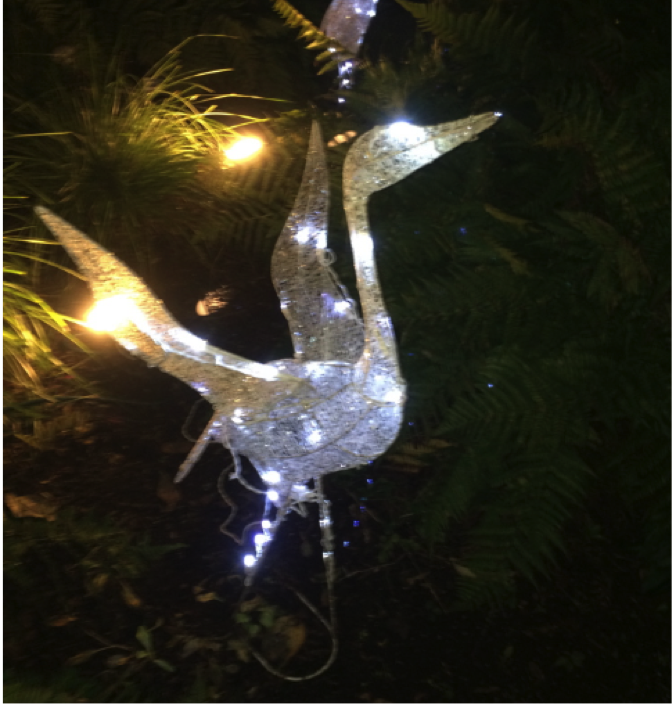 A local tradition since 2005, Enchanted Airlie is a spectacular display of lights around the gardens. 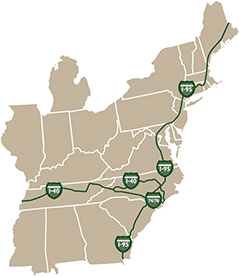 Guests will walk a trail .5 miles while enjoying the twinkling lights, detailed displays, manicured gardens, and views of the Intracoastal Waterway. Additionally, Santa Claus will be at Airlie Gardens ready to hear children’s Christmas Lists. There will also be vendors selling food and beverages including hot chocolate, popcorn, beer, wine, cookies, and more! There are two times slots for guests to explore the gardens per night. The first one is from 5-7 and the second is from 7-9. Enchanted Airlie is currently running every night now through December 22nd. For more on the event visit their website http://airliegardens.org/events-news/enchanted-airlie/. 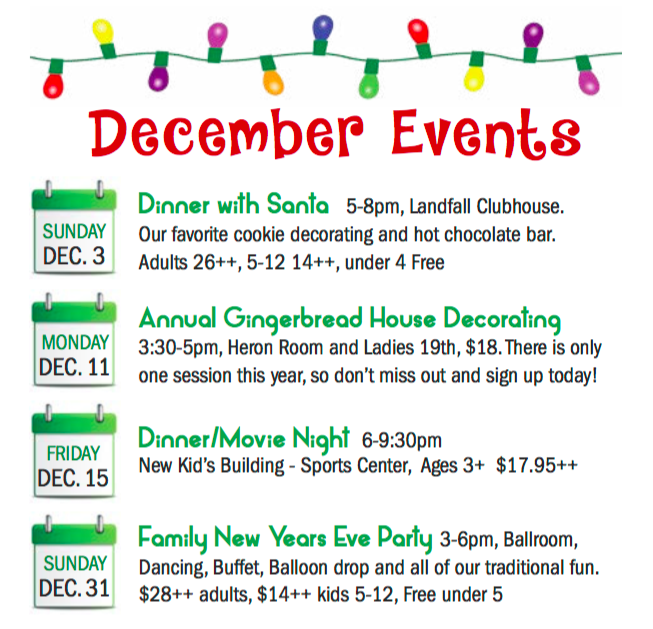 Tomorrow there are three exciting events happening at the Country Club of Landfall. 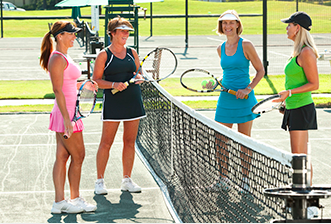 First there is a women’s round robin tennis tournament, which takes place from 11:00am until 12:30pm. All levels are welcome to join this fun sporting event! spend quality time with your partner. Nicklaus Golf Shop. 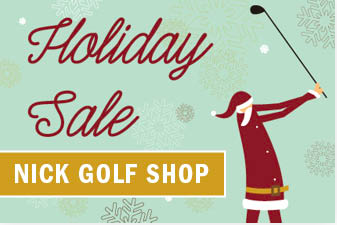 In addition to big merchandise discounts, there will be cocktails, snacks, and free giftwrap all compliments of the Golf Staff!